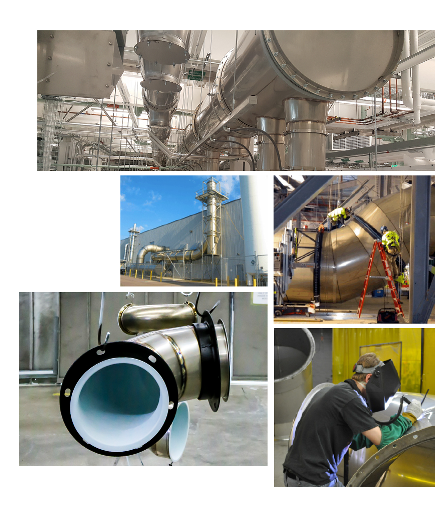 Fab-Tech Inc. manufactures PermaShield Pipe (PSP®), a Factory Mutual approved system of stainless steel corrosive fume exhaust duct with PermaShield Fluoropolymer Barrier Coating on interior surfaces. PSP® combines the reliable strength of stainless steel, the superior corrosion resistant attributes of fluoropolymers and an array of innovative fittings to provide safe, reliable and clean corrosive fume exhaust systems. For new construction or facility renovations, consider the benefits of PSP® duct. Fab-Tech has the capacity to meet your schedule when delivery is critical. PSP® installs clean to save you valuable time and money, uses Class 1A AMCA dampers certified for low leakage, and has the largest selection of available accessories to make installation easier and faster. PSP® is the only coated duct product available with a "0" Flame Spread rating.